by Fr. Paul Trinchard, S.T.L. Fr. Paul Trinchard evaluates Rome's Year 2000 Fatima Third Secret, integrating the Vatican II changes with the Fatima Message. In a unique, totally orthodox approach, Fr. Trinchard presents Our Lady's urgent and crucial message, convincingly, relevantly and devotionally. 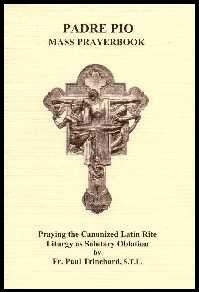 "As more and more of the Catholic laity return to attendance at the immemorial Latin Mass, there is a felt need for a vernacular translation of the Latin prayers which is accurate and reverential. Fr. 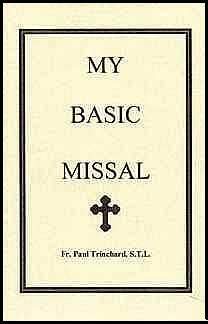 Trinchard's MY BASIC MISSAL meets this need. No greater praise can be given of this work than to say that Pope Saint Gregory the Great who codified our beautiful Mass in the 6th century, would have been wholly enthusiastic for this translation -- its grace, its accuracy, its prayerfullness. 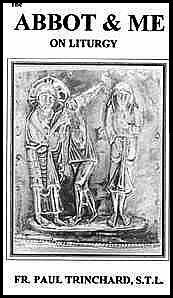 I have shown it to several officials in the Roman congregation, and they singly praise it highly." 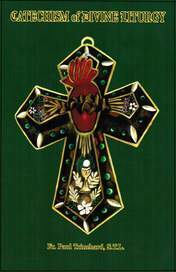 Dedicated to St. Padre Pio of Pietrelcina, the Saint of the Canonized Mass, this prayerbook by Fr. Paul Trinchard, helps Catholics to live the Mass: offering the daily suffering, joys and happenings of his own life through, in and into Christ's Holy Sacrifice of Calvary, in order to become part of Christ's Memory, as expressed by Christ at His Last Supper and Testament. Contains the Ordinary of the Mass in Latin (left page) and English (right page). Who is the Abbot? Abbot Gasquet of Benedictine Monastery, Downeyside Abbey, England, in 1913, gave a series of Advent Sermons (on the Catholic Mass) in St. Patrick's Cathedral in New York. An historian, Abbot Gasquet was head of Pope Leo XIII's Commision on Angelican Orders. Abbot Gasquet composed Pope Leo XIII's Apostolicae Curea, which decreed Anglican Orders and Services invalid. THE MASS THAT MADE PADRE PIO - - Padre Pio prayed the Holy Mass to such a degree of sanctity that he actually suffered the passion of Christ. Abbot Gasquet enlightens us that the Mass is Christ's unbloody sacrifice of the Cross, the priest in persona Christi offering Christ-- immaculatam hostiam, Immaculate Victim, Christ, not a piece of bread, not a spotless host. And Pope Leo XIII spells out to us what is necessary for a valid intention for both ordination and for Holy Mass. All three persons are modern day defenders of the Faith. All three for $32! Love and dedication to the Canonized Latin Mass should be built upon a comprehensive understanding of the Latin Mass prayers. Latin Mass is made easy with this book by Fr. Trinchard. It is an excellent tool for teaching Latin Mass and explains the Latin Mass as the Church has always taught it. In the aftermath of Henry VIII, Catholics suffered martyrdom upon discovery of Holy Ordered priests offering valid Canonized Latin Masses in homes. In 1896, after centuries of uncertainty, it was Pope Leo XIII himself, who declared (Anglican) “New Mass” and even “New Ordinal” “null and void” or invalid. If one cannot go to Jesus Christ in Divine Liturgy, one can reach Jesus through His Mother, Mary, by praying the Holy Rosary. Praying the Holy Rosary brings one closer to Jesus, since the Joyful, Sorrowful and Glorious Mysteries of the Most Holy Rosary reflect the memory and relevance of Christ to us. The more one prays the Holy Rosary, the more one becomes intimate with Jesus and His Mother, Mary. If you do either or both of these lovingly, you will achieve intimacy and grow in knowledge and grace before God and man. This book presents the essence of the character of Padre Pio and reflects upon the impact the Mass prayers should have upon those who attend. 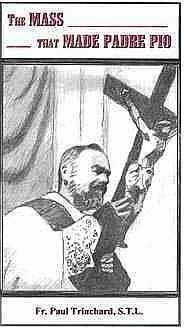 Did Padre Pio receive the Stigmata of the Crucifixion because Christ's Sacrifice, the Mass, was his love and his life? Under his patronage, will the Holy Sacrifice of the Roman Rite be restored to its rightful place? Will devotion to Padre Pio as the Saint of the Canonized Mass help solve the problem of today's liturgy? Praying the Holy Rosary brings one closer to Jesus, since the Joyful, Sorrowful and Glorious Mysteries of the Most Holy Rosary reflect the memory and relevance of Christ to us. The more one prays the Holy Rosary, the more one becomes intimate with Jesus and His Mother, Mary. Fr. 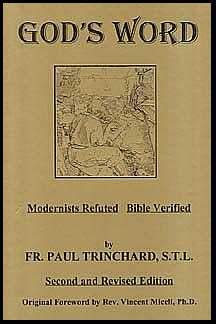 Paul Trinchard provides a much needed catechism for our times, explaining God's revelation in His Holy Bible; the necessity for following Christ's Divine Liturgy; the dire consequences which result from the rejection of God's revealed commandments; the futility of replacing God with Man; and the absolute necessity to return to God and His Divine Liturgy of Salvation. As a Newchurch priest of my times, I taught physics, English, religion, etc. to Jesuit High students who excelled, winning many honors. I am a good teacher! However, I failed to understand and master the "art" of teaching new diocesan religion in grades K through 12. I had only five years of graduate theology. I wasn't an "updated" religion teacher, not even for grammar school. When group circles were "in" priests and what they stood for were "out." I was "the priest," an obstacle to a "growing Christianity;" an obstacle to each defining oneself as God. I was banned from teaching religion then, but because of a temporary change in state policy, I was later designated to do so. "Are you certified to teach religion?" asked the nun filling out the diocesan form. "No," I answered but added, "neither is the Pope." 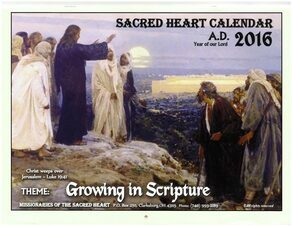 Some call it the "Catechism Calendar." It teaches the Traditions of our Faith. It contains Feast Days and Days of Fast & Abstinence, plus information every Catholic child once learned. 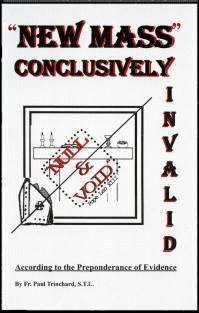 Explains the author's contention that the Novus Ordo Mass is invalid, with historical background showing how the change to the new Mass came about. One Message One Truth is a look at various Marian apparitions fully approved by the Catholic Church. Examined are the messages of the Blessed Virgin, the words of the visionaries, and also comments made by several popes about the events including Benedict XVI, John Paul II and Paul VI. 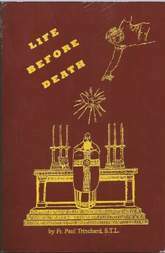 Originally printed 1941, Confraternity of the Precious Blood. 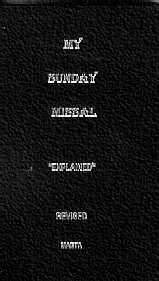 Contains Latin/English Ordinary with Propers for all Sundays of the year. Numbering system explains how to follow the Mass. Present edition published by MAETA, with exegesis of Mass prayers for laymen. Shows how the new "Mass" is compatible with the New Age -- promoting the dethronement of God & the enthronement of man. Explains new age Catholicism in the end times. Why are Fatima Consecrations ignored? Is the Fatima Message fulfilled? What are your God-given duties? Your eternal salvation may depend on having these answers! What are the words of prophecy most important to us today? What is the prophecy that was given and now is fulfilled? What is the prophecy "active and alive among us?" "Apocalypse" is a "hiding" and a revealing: that which is hidden (or seen as through a veil) is now revealed. 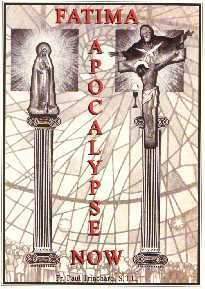 What is the "revelation" of the Apocalypse? Fr. Paul Trinchard addresses the shallow ecumenical views expounded by progressive theologians in post-Vatican II times. He defines the one and only Church of Salvation according to the Christ-bestowed Divine Liturgy. 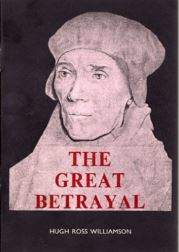 He provides the key to understanding the evolutionary-based nonsensical "newspeak" of the popes of our times. Is the existential church "Catholic" or "apostate?" Does the "New Mass" pray a new religion? Is the post-Vatican II Church one, holy, catholic and apostolic as defined according to Catholic Tradition? Are modern bishops "living Apostles" among us? Would "pre-Vatican II popes" concur with post-Vatican II expressions of faith and worship? Has the Church committed suicide in altering Her liturgy? Where is the Church of the four marks - Christ's one and only Church of Salvation?